Boston Marathon Longest Continuous Running Event in America's History, Bob Shures Boston Monument. The longest continuously run annual marathon in the world, the Boston Marathon ends here with this sculpture. Situated in Copley Square, adjacent to the finish line of the Boston Marathon, this memorial celebrates the race’s 115th running. At first, the memorial might be easy to miss: instead of rising up vertically, like most of the sculptures this tour highlights, the memorial consists primarily of granite patterns set into the ground. The central medallion traces the marathon’s course from the suburb of Hopkinton to Boston’s Back Bay, and an elevation map shows off its notoriously difficult hills. Around this central medallion are inscribed the names of the marathon’s winners, including Bobbi Gibb. Initially disguised as a man, she first ran the marathon in 1966 when women, thought to not be physiologically capable, were not yet allowed to enter the race. Depictions of the diverse runners of the Boston Marathon are captured in bronze reliefs on posts around the medallion. Winthrop Lane Downtown Boston paved with brick sized Boston Monuments. 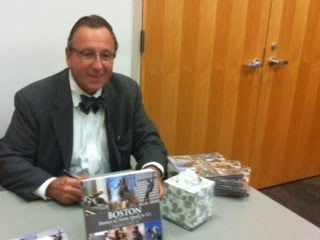 "Boston Bronze and Stone Speak To Us"sold on Amazon.com and Old North Church Gift Shop Boston North End. Batter Batter, The Cy Young Award originated with a Boston Baseball Player of course, Boston Monuments. Cy Young, legendary pitcher for the Boston Americans (later renamed the Red Sox) came home to Boston on September 29, 1993, thanks to the generosity and commitment of the Yawkey Foundation II. World Series. 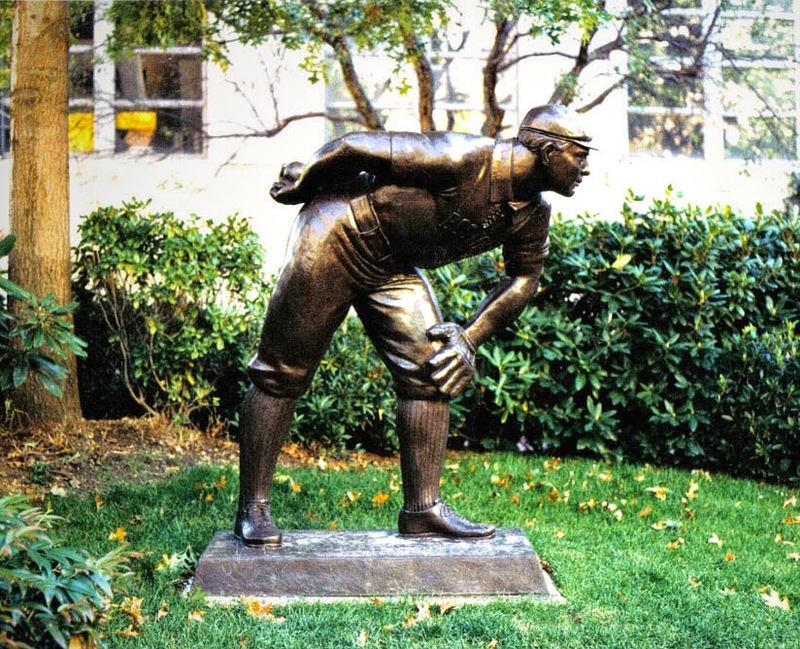 The statue, created by nationally known sculptor Robert Shure of Woburn, Massachusetts, and home plate are located between Churchill Hall and the Cabot Physical Education Center. This tribute to baseball and the Red Sox represents a visible link between Northeastern University and the city of Boston, a connection characterized by both changing landscapes and lasting achievements. The Skylight Studios in Woburn, MA., the only one of its kind in New England, has performed numerous creative and historical tasks for clients in all parts of the world. Robert Shure, of Skylight Studios, also has restored many famous Boston monuments. To mention a few, the Old State House Lion and clock as well as The Massachu- setts State Seal. Robert Shure has had his creative and ar- tistic hand in “Hear Us” - State House Women’s Leadership Project, The Irish Famine Memorial, The Police and Fire Memorial as well as others. Cy Young is one of hundreds of Boston monuments found in our "Boston Bronze and Stone Speak To Us" guide book for Boston Monuments. Patriot- Bridge Newspaper Reprint of "Boston Bronze and Stone Speak To Us"
The annual Running of the Boston Marathon, Boston Monuments Boston Guide Books 2015. Marathon, just the Bonnie Belle, but I ran all year round and loved the exhilaration that it elicited. After watching the 1991 Marathon, I started thinking about what a sculpture might be like for the Boston Marathon, the oldest foot race in the United States. I wanted to create a sculpture that would be attractive to children, yet be a meaningful metaphor for the race. I knew the marathon was based on a Greek warrior who in 490 B.C. ran approximately 25 miles to announce the news of a great military victory. The Greek connection of using another kind of race, that of the fable of the Tortoise and the Hare created by Aesop ( ?620- 560 B.C.) came to mind. I couldn’t show a man running, or a woman, or a person in a wheelchair. It would be impossible to portray all the people from all over the world who run. The tortoise and the hare seemed a perfect metaphor to represent the wide variety of people who participate in the marathon people of all ages, shapes and sizes, many of whom finish, but walk over the finish line. want to have that wonderful sense of accomplishment. Persistence pays off. Slow and steady wins the race. They want to be a part of one of the most important sports event in the country. 1996 was the 100th anniversary of the Boston Marathon. I wanted to do something to commemorate that event. I hope that children will cherish these animals pat them, hug them and learn the important lesson that the fable teaches. The Friends of Copley Square have sponsored this sculpture and they believed the fable was an ideal cou- pling of it and the Boston Marathon. The sculpture brings a needed human factor which is significant to the neigh- borhood and its children. This bronze monument, like so many created by intuned sensitive artists, helps this particular community make restitution through art. People need to remember the Seminole Indian Tribes were once here dominating this area before Europeons entered their land. This bronze statue is part of the wound healing process. Boston Bronze and Stone respects our native American brothers and sisters. "A 12-foot tall life-sized bronze statue of a young Seminole Indian girl, base and palm fronds included, will be unveiled and dedicated Friday in Fort Lauderdale. The monument, titled "Florida" will be located at Stranahan Landing, directly across the New River from the Stranahan House. "The statue and even the base are very symbolic, this has been quite a painstaking process that originated several years ago to commemorate the 500th anniversary of Florida," said William Riddle, president of the Venetian Arts Society based in Fort Lauderdale. 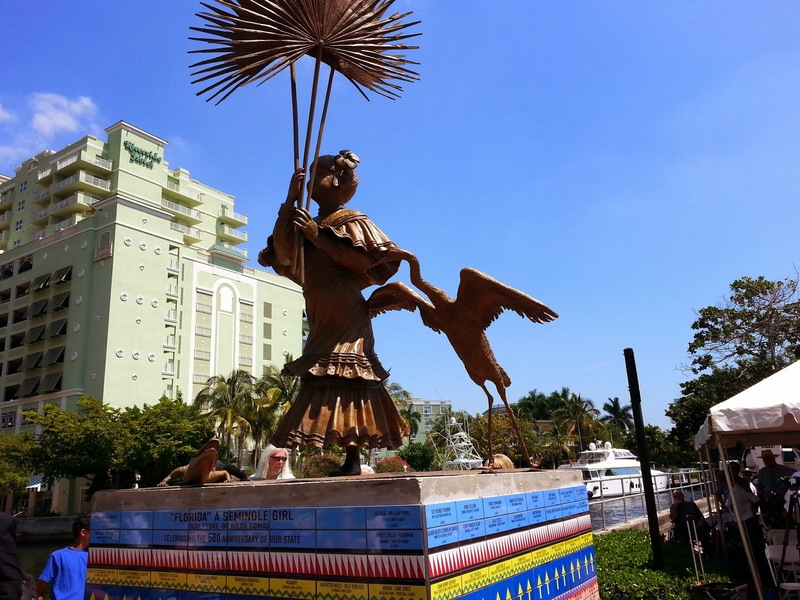 The statue depicts a young girl playing in the Everglades and holding palm fronds. The sculpture will have interactive features: information about the tribe accessible by waving a smart phone near the sculpture. The sculpture is 8 feet tall and the base is 4 feet. The sculpture cost $100,000, half of that amount provided by the Seminole Tribe and the other half raised through a sale of tiles that will adorn the base. The event starts at noon, and will feature Seminole Tribal Chairman James Billie. The unveiling is scheduled for approximately 12:30 p.m.
"Boston Bronze and Stone Speak To Us"salutes the above sculpture and sculptress. Artist Nilda Comas created the sculpture. She is the art curator for the society and became interested about four years ago in creating a sculpture to commemorate the state's anniversary. She worked on the piece for about a year."